In 1732, two young Moravians left their comfortable community of Hernhut, Germany, convinced that they were called of God to bring the Gospel to the slaves in the West Indies. They went, willing to become slaves if necessary, to minister to these oppressed people. The Moravians pioneered a mission movement characterized by extraordinary commitment. Under the dynamic leadership of Count Nikolaus von Zinzendorf, the Moravians sent out more missionaries in 20 years than all the other Protestant groups had in 200 years. They were driven by two strong convictions: world evangelization is a prime obligation of the church, and every member of the Christian community has this responsibility. First Fruits unfolds the suffering which these young men endured for their missionary zeal and the agony of their community in deciding to send them forth at a time when missions to the heathen masses were unthinkable among Protestants. You will especially marvel over the "first fruits" of their ministry and the impact of their vision on the course of Christian history. Fullscreen. Produced to commemorate the 250th anniversary of the beginning of the Protestant mission movement, this is one of the oldest offerings of Vision Video's catalogue. It holds up very well, with its high production values. It's transfer to DVD will be welcome to those engaged in mission education, making it easier to find individual scenes, thanks to the chapter headings. 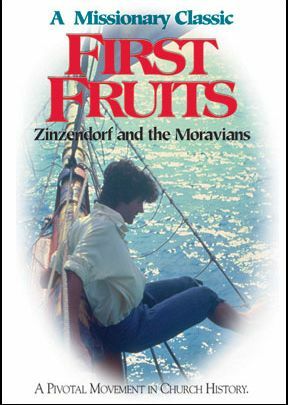 The sub-title of Zinzendorf and the Moravians is not quite accurate, although the famous Count is an important figure in the film. The story focuses upon a young potter named Leonard Dober. He has come to the settlement of Herrnhut which the Count and Christian David had established on the Count's estate as a refuge for the spiritual descendants of Jan Hus. Coming mainly from Moravia and Bohemia, where they had been persecuted for centuries by the Catholic authorities, the settlers had built the village from scratch and established a thriving community in the 1720's. The film begins in 1731 with the reflections of Leonard upon their experience and awaiting the return of Count Zinzendorf and Christian David from the coronation of the Danish King. At the community meeting that night, Zinzendorf speaks enthusiastically, but it is not the coronation about which he is excited. It is his meeting with Anthony, the servant of a fellow count who had been a slave on the island of St. Thomas. Anthony has become a Christian and he desperately longs for the gospel to reach his people back home. The Moravians, the Count points out, had known persecutions because of their faith, freely chosen. Anthony's people, however, had suffered cruelly from no choice of their own. Describing the terrible condition of the slaves in the Caribbean, the community in the hope that there might be some who would be moved to go and share the gospel. The rest of the film follows Leonard, from his prayerful decision to his agreeing to become a slave himself in order to share the lot of the hapless people he has come to serve. It is a story of great faith, courage, love and the beginning of a great movement of Moravians to people throughout the world. Well told story of missions in the 1700’s. Easy to follow story with a good evangelical message.